I am a Disney fiend if you didn’t know. It is safe to say I have watched every Pixar affiliated Disney movie, and more than my fair share of Disney’s older animated movies. Ever see those memes floating around of “how many Disney movies have you watched”? Well, I’m that person that can say close to all! IMDB: Despite his family’s baffling generations-old ban on music, Miguel (voice of newcomer Anthony Gonzalez) dreams of becoming an accomplished musician like his idol, Ernesto de la Cruz (voice of Benjamin Bratt). Desperate to prove his talent, Miguel finds himself in the stunning and colorful Land of the Dead following a mysterious chain of events. Along the way, he meets charming trickster Hector (voice of Gael GarcÃ­a Bernal), and together, they set off on an extraordinary journey to unlock the real story behind Miguel’s family history. I cried. I literally cried watching this movie. The focus on family, the emphasis on putting your family first above all else, is heartwarming. What I thought would be a hard topic, death of a loved one, is put to such a beautiful light and celebrated in a way even my toddler is able to understand. 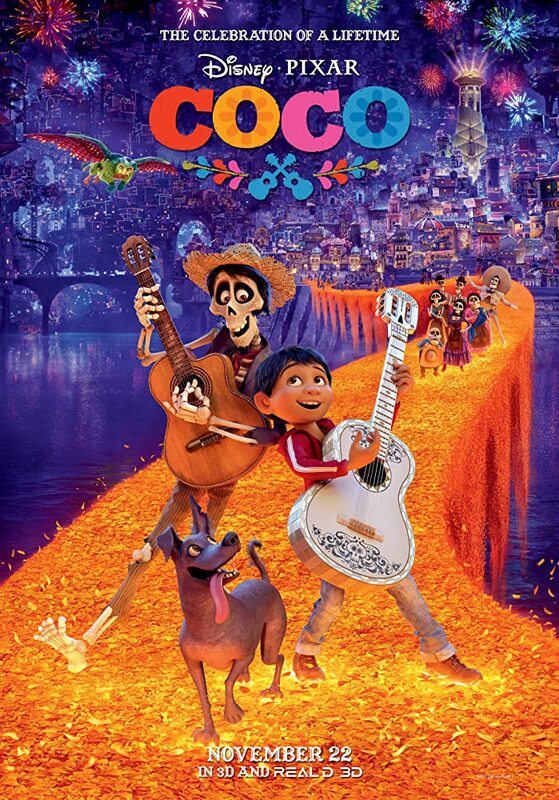 The music in this movie is awesome, very mariachi style, true to its Mexican roots. My daughter loves the soundtrack, and to hear her try to pronounce some of the Spanish words cracks me up! “Un Poco Loco” is her favorite, but I swear it sounds like he is saying un coco loco or un pollo loco. The imagery in this movie is so beautiful with its bright colors and smooth transitions between hot and light coloring. The detail these artists went through to put the designs on the skeletons typically seen on the Day of the Dead celebrators is incredible. It is something to be seen. I highly recommend this movie and love it whole-heartedly.